In the summer of 2009, with the aerial photo still hot off the presses, Arlene saw a video clip about a village of women and children in Africa who collect washed-up flip flops from the beach and make them into art. The project that caught her eye was a life-sized whale made entirely out of flip flops. Could six teachers and their first grade children do something like that? How could it be done? 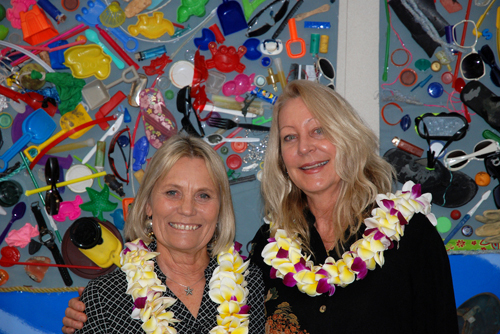 Through a conversation with another surfer/educator, Arlene was introduced to Teresa Espaniola, an environmental artist living in San Diego who uses beach trash to bring awareness of ocean pollution through art. When they met, Arlene shared her dream and Teresa suggested ways to make it doable. Together they exchanged more ideas with the rest of the teaching team, and thus began the six month process of creating ‘Little Gray’, a life-sized baby Gray Whale made from canvas, a little paint, some glue and lots and lots of BEACH TRASH! When the school semester started in September 2009, the team of teachers began a curriculum of ocean-based education in math, reading, music, science, art and physical education. The children went on supervised beach clean-ups with their teachers and parents. Using buckets and grabbers to pick up beach trash while following instructions on what not to gather, (anything you would find at a doctor’s office), the collecting began. The trash was brought to the classroom and given a sanitary bleach wash by the teachers before the kids were allowed to actually handle the trash. As you can imagine, the piles of beach trash grew steadily as the months went by. There were plastic bottles, caps, snack packaging, sand toys, lighters, fishing lures, plastic dolls, plastic forks and spoons, balloons, light sticks, food containers, sunglasses, straws, pens, juice packs, soda cans, surf leashes, flip flops and shoes, caution tape, nylon rope, even a set of dentures! Unfortunately, it was all very easy to find. As the months passed, the ocean education expanded from further out in the community. The children were invited to SEA LIFE Aquarium to tour the facility while receiving hands-on education about marine life. Their teachers taught them about storm drains and how urban runoff is not filtered before it dumps trash and contaminants into the ocean. 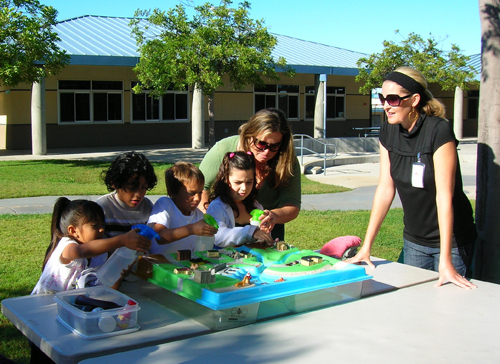 Heather Bensen, mother of a first grader and representative for Surfrider’s ‘Kids For Clean Water’, gave the children a watershed demonstration to show how everything is uphill from the ocean. During her fun forty minute presentation they learned about the water cycle and about different sources of pollutants. They touched sponges, mollusks and a pair of shark jaws. They also created a ‘rain storm’ on a water shed model full of ‘pollutants’. Animal droppings (in the form of chocolate sprinkles), plastics litter from beaches and streets (colored cake sprinkles), oil (chocolate syrup) and pesticides from farms (red cake sprinkles) were placed on the water shed model. After the ‘rain storm’, the students compared the clean, clear ‘rain’ water of a squirt bottle to the brown, polluted water that landed in the ocean after the storm. The kids loved it and really ‘got it’! 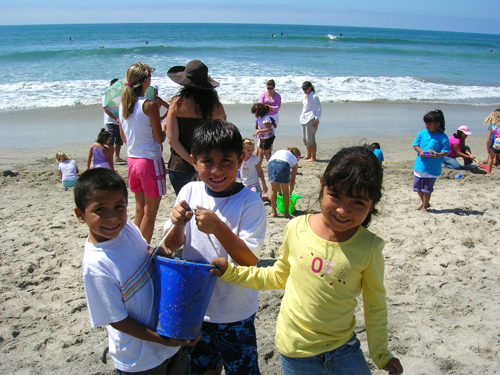 With the help of their teachers and the ocean-related curriculum, these first grade children have begun educating adults about the problems faced by all marine life because of ocean pollution. Meanwhile, the school began fundraising to pay for the project supplies. A former teacher, Jo Fitzpatrick, donated hand-made greeting cards to sell. The school sold other donated items. SEA LIFE Aquarium generously gave money for supplies. Canvas was bought off the roll, measured, and cut into six panels, one for each first grade class. The panels were hemmed and sleeves were sewn to hold the wooden dowels that would hang each panel. Next, Teresa prepped the sewn canvas with a base coat, then painted the whale gray and the ocean blue. Arlene bought the wooden dowels, which her husband cut to size, then she ordered the glue while keeping the timing of everything in check for the February 18th unveiling at Jefferson. 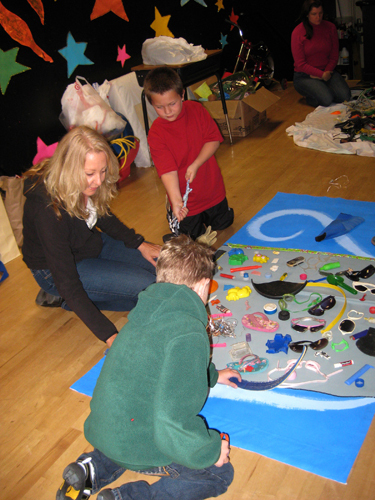 By January 2010, it was time to put children + beach trash + art together! Teresa came to the school and met with each class one by one. The teachers brought the kids and their booty of beach trash into the auditorium. Each child choose several pieces of trash and Teresa let them choose where they wanted to place their trash on the whale panels. Every child got to participate. Parents volunteered to help glue the placed trash pieces onto the whale panels. SEA LIFE Aquarium sent a crew to document the process. As you can see by now, it was a family and community affair! On February 18th, The ‘Beach Trash, A Whale of a Problem’ project was celebrated at Jefferson Elementary School with a standing-room only crowd. An unbelievable variety of whale artwork created by the 1st graders was on display. Carlsbad’s Danish Bakery donated hundreds of cookies for guests to snack on while viewing the art. The evening, emceed by Arlene, included recognition of those who took part in the project, a wonderful slide-show presentation by Mrs. Kopp, special guest speaker Jon Severino from the Surfrider Foundation’s ‘Rise Above Plastics’ campaign, a visit from the Chico ‘Bag Monster’, (wearing a costume made from 500 plastic bags - the amount that ONE SHOPPER per year consumes when not using reusable bags), a heartwarming medley of songs sung by the amazing first graders and finally, the unveiling of ‘Little Gray’! The evening was a perfect example of community. The children were beaming. 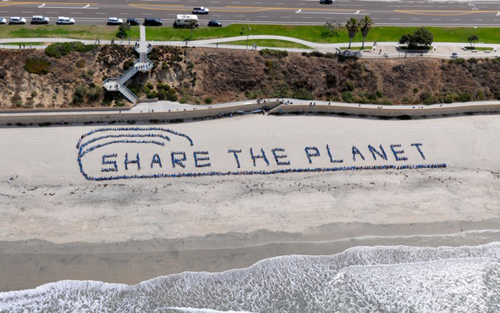 As was always intended, ‘Little Gray’ is continuing to spread the word about ocean pollution. SEA LIFE Aquarium, whose invaluable support continues, are displaying the whale for children and adults to view. You will often hear an “Ooooh!” or an “Ahhhh!” or “How did that hairbrush end up in the ocean?” The response from residents and visitors alike has been overwhelmingly positive. The first grade children from Jefferson Elementary School have realized that they each have the power to make a difference and they have become stewards of our oceans. May ‘Little Gray’ sing its whale song of change to children and adults around the world. What are some tips on making the model on the clean water demonstration? Great to see people all over the world giving their best to live in better balance with Nature! We´re here so far away from you guys, and the motivation is the same…the passion for our precious Earth is what moves us to keep on doing what we do….learn and teach the ones around us for the urgency of being aware of the preservation of our HOME…. The amount of the everyday marine litter we find here is amazing….little things left behind in other parts of the globe end up here…after days/months of ocean travels. We’ll keep in touch with your precious work there!! The best to you all! !